That remote-controlled lawnmower you’ve been using is many times more convenient than a regular mower. It still requires you to pay attention, though, which means you can’t get the grass cut while finishing a mission on LA Noire. Maybe it’s time to upgrade to a Robomower. A robot that mows your lawn all by itself, the automaton should make a nice addition to your lineup of unattended robot cleaners. Just make sure you don’t mix them up with each other — throwing the Polaris Pool Cleaner on the lawn and the Neato Vacuum into the pool will probably end up in a disaster. 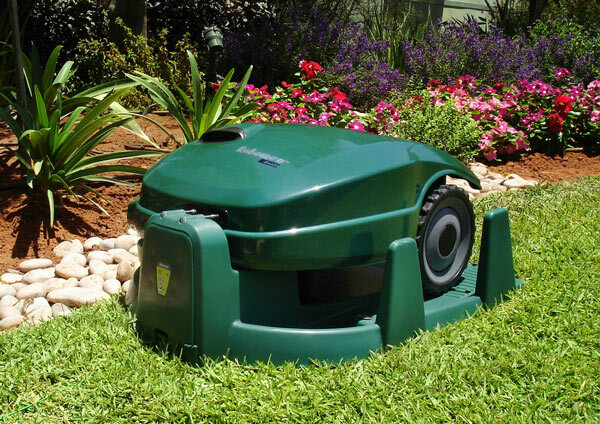 The Robomower comes in two models — the RM400 for smaller lawns (up to 4,300 square feet) and the RL2000 for larger grass areas (up to 6,600 square feet). Both slash through your grass using mulching blades (one on the RM400 and three on the RL200), powered by a 5800 RPM motor. Like other autonomous robot cleaners, it will stay on its base charging station until the scheduled mowing time and return there once the job is done, all without any supervision. In case you’re afraid of having it stolen, it comes with an integrated theft protection system (no, it won’t shoot lasers at thieves, which would have been awesome). One caveat: you’ll have to peg small wires to the ground around the perimeter of your lawn and leave it there. The robot’s internal navigation system will use those as placeholders for monitoring their position, relative to the entire mowing area. 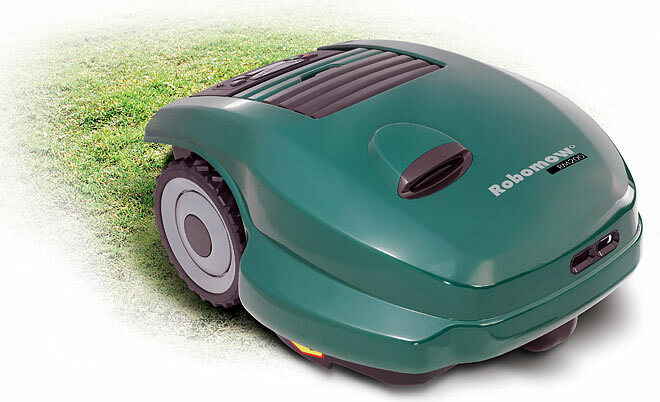 While the Robomower will mow at a slower pace than manual walk-behind mowers, we doubt you’ll care, since you don’t have to spend the day doing anything to keep your grass tidy. It’s available from Thinkgeek, priced at $1,999.99 for the RM400 and $2,799.99 for the RL2000. Thinkgeek has done a lot to make GEEK sound COOL, and the Robomower is right at the top bit of the ladder when it comes to making a seriously astonishing impression on the mind of the ordinary consumers who generally do not dare to even expect any novel product that has the substance to change the game, and the way it is played. I would admit that I belong to this class of customers. 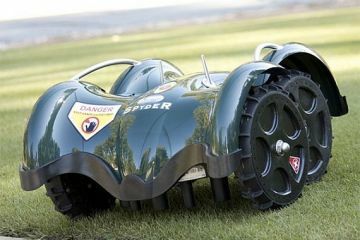 I did not have any idea about the existence of remote controlled lawn mowers either! A robotized lawn mower would have sounded like a technician’s joke rather than anything else had it not been posted on coolthings. This has been an intriguing read as always. All kudos to the writing and research teams of coolthings.com for maintaining and improving incessantly on the content. The writers (or writer) in particular need to be congratulated upon for the suitably cool and casual tone employed to frame the content. Seriously, I have never closed a coolthings page without a big grin on my lips and my eyes widened by the wonderful products hosted on these pages, the latest being this robo avatar of the good old land mower. The first sight of the Robomower is not suggestive of its powers and abilities at all! In fact, I mistook it as some kind of a crazy kiddo toy in the form of a car. I am certain that not many would be able to guess that this green ‘toy’ has anything to do with mowing a lawn. What a sight it would be though, to see the Robomower spring into action and mow the lawn all on its own while its owner basks in the glory of his purchase. It could be so satisfying to observe all the beautifying action on a cold winter’s day while sipping a cup of hot coffee, or gulping a chilled beer on an equally hot summer’s day. I have been a naturalist and a gardening addict for more than ten years now. For some inexplicable reason, I do not quite vouch for fanciful technology in something as close to nature as a garden. And I can already think of half a dozen reasons that would make one stop and think before signing the bill for the purchase. How good would your garden look with the small wires that you’d need to be digging in the grass for the Robomower to calculate its moves? If you are fine with the high tech mess that you’d be turning your garden into, what about the pleasure of seeing the grass even out under the action of the manually operated mower? Would the Robomower guarantee symmetry of cutting? Yes, it would do so if your garden has flat base, but not many have perfectly flat bases! Wouldn’t the troughs of the surface make the robo-mowing a bit too unreliable? Who cares anyway, I do not even half that much money to buy such a crazy thing. 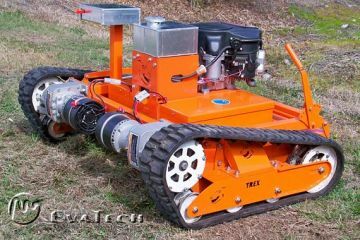 Considering the speed at which automation is embracing almost everything around us, it almost comes as a surprise to note that the conventional lawn mowing has taken so much time to hit the automation lane. But as they say, better late than never! The Robomower would most definitely be a worthwhile purchase for all those who have their beautiful countryside villas with sprawling gardens to keep up. What a luxury to have a robotized servant who would mow the lawn for you and return to its charging station! Stunning, to say the least. I am missing a little video review here though, but I guess there would be many around the web. It would be very interesting to see how this new age lawn mower handles the mowing. I think I read that it is on the slower side, but it is fine till the time there is no need for regular manual inspection. It would be disappointing to be told that the whole act takes something close the time taken by manual lawn mowing, taking into account the wire settings and all other issues. I guess I would need to answer all the queries I have just raised by looking at a video or two, or maybe reading some customer reviews. It’s a good thing they included an anti theft module inside the thing. I hope they made it waterproof as well. The idea is to do away with the time consuming manual lawn mowing by changing over to the Robomower. But you would really expect your robo lawn mower to manage itself in a storm. The lawn might not be your concern when you return home to realize that your $2,799.99 costing RL2000 Robomower soaked an ounce or two of water more than it liked and choked out right in the middle of the lawn. Well, I not too deep into LA Noire, but could actually do with an automatic lawn mower to do the mowing on the weekend instead of blistering my hands with the heavy manual machine. I could really utilize the day off on the gym rather than the lawn. Ah, I suddenly remember the price tags attached to the Robomower! And I suddenly see the beauty of mowing my own lawn myself, with the good old machine that has seen the rusts of time but still managed to keep the lawn presentable for so many years. Plus, it might not be possible to maneuver the Robomower to create deliberate grassy impressions, as can be done with the conventional machine. I think I might as well post in a comment hers. I have already mailed the link to this super cool article to my well off garden mending pals. I certainly know that at least a couple of them are going to ring me up to thank, and the next thing they would be doing is to plan out the purchase. Gardening is one passionate man’s engagement! And modern day gardening is the rich man’s game, as it seems from the rather unforgiving price tags attached to the RM400 and the RL2000 Robomower. Robotized land mowing, interesting! More than lawn mowing, I guess people would appreciate a robotized lawn watering product. I must admit here that I am not too well informed about the new products available in the market, just in case some of you plan to post a link to something like a Robo waterman! Nonetheless, it is a great idea, and most probably, this thing is going to be in action around the countryside in the near future.